Push pull against Single Ended! One against the other: push-pull versus single-ended! Among tube nuts there are different opinions on how a good amplifier with vacuum tubes should be designed and made: PCB'ed against hard wired, high power vs low power, solid state PSUs against tube rectifiers but...most of all...push-pull VS single-ended. Roughly speaking, pairs of push-pull vacuum tubes allow to build high power amplifiers but the complexity of the circuit trades off some transparency. Single-ended designs, being much more "straightforward" (almost a wire with gain) are said to be much more "musical", transparent and natural sounding...on the other hand they deliver only few watts of output power. I don't want to support one or the other brigade, just put two similarly priced designs one against the other to discover if is there some truth in these audiophile myths. 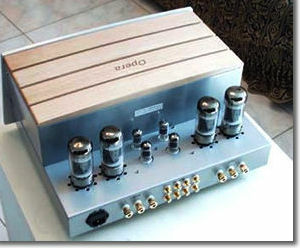 Finding similarly priced push-pull and single-ended designs isn't an easy task, finding two such amps from the very same manufacturer seemed even harder....until I came across Opera Audio, a Chinese HiFi Company, and its vast catalogue of amplifiers, either solid state or "tubed" ones (even hybrids!). Enter the Opera Audio Consonance 8.8R and the J 500 Plus: the first is a quite traditional push-pull of 6550's (a KT88 option is available) which delivers 50 watts per channel, the other is a minimalist single-ended design using the famous 300B triodes delivering a mere 9 Class A watts into each channel. Both amplifiers make use of chinese or Russian ElectroHarmonix vacuum tubes. Opera Audio claims a "biased voltage" of -35 V and a current (Ip) of 40 mA (Class AB, perhaps, seems more reasonable). The input stage uses 2 dual triodes 12AT7 while the driver stage uses 2 x 12BH7's. The 4 x 6550 tubes are claimed to be selected pairs. These two amplifiers have been delivering their watts into different sets of speakers for several months (thanks to CometAudio, the Italian distributor). I've tried to match them with different "partners", including tough loads (Thiels) and easy stuff such as full-range crossover-less loudspeakers. This comparison test shouldn't appear as comparing apples to oranges. Instead, it makes much sense to me. 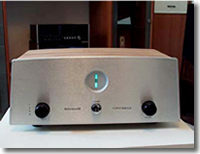 Choosing a HiFi component is ALWAYS a compromise, a "give and take" game. In this article I'll try to describe you what to expect from these different designs. Let me remark that my findings will be related to this very pair of integrated amps and by NO MEANS they can be "extended" to different and more general situations. Enough of this blurb, here we go. The 8.8 R makes use of a quite unusual "magic-eye" as power output indicator. More or less, it is the same device you can find on old tube radios, where the magic-eye (a vacuum tube) was used to station fine tuning. The claimed 50 watts, as far I can guess, are realistic so this amplifier is perfectly comparable to a mid-powered solid-state integrate amp, in terms of raw output power. Let me note that it does sound exactly like a 50 watter, despite the urban legend that claims 50 "tubed" watts equal 100 "solid state" watts. In my opinion, this is just a legend, nothing else than that. Its tonal balance is rather on the warm side, with a recessed mid range and a pronounced, overblown mid-bass. 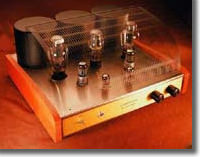 If this is what you'd expect from a traditional tube amplifier...well, this amp won't delude you. Anyway, there's something fascinating and charming in the sound of this unit, something that lets you listen to your favourite Music for hours and hours, forgetting the meaning of "listening fatigue". It does nothing to stay "neutral" or tonally balanced. Instead, it seems it finds amusing to impose its tonal balance and interpretation to the Music it plays. Despite the different pairs of speakers I've used to test it, the amplifier sounded more or less the same, obvious differences aside. The overall distortion is very low, even at high listening levels tough the tonal balance seems to vary with the position of the volume control. It sounds softer and euphonic at low levels, then becomes more aggressive when playin' it loud. This is a problem which is common to many amplifiers but with the 8.8 R the phenomenon is very noticeable. This phenomenon is certainly due to the aforementioned "recessed" midrange that helps to tame harsh recordings but subtracts "life" when needed, as well. The same happens to guitars and string instruments in general. All goes well when they get played softly...but when the going gets rough the amp adds too much (velvet) of its own and loses the plot. Not different its behaviour with drums and percussions. Let me put this straight, before going any further: this amplifier sounds dead slow. It imposes its own (slow) pace to every kind of Music it plays. Though this may seem bearable with no-rythmic Music, it becomes BORING with the musical genres that LIVE thanks to the rythm. So, while this amp may sound charming with some Music, with rock it may become boring as hell (or is it Paradise to be boring? :-)). Just play something like Prodigy, Chemical Bros, Maxim etc and you'll live an almost mystical experience. This amp is able to subtract almost every bit of energy from those tracks. Of course, in the long run, you can even get used to this kind of "performance" but - to my ears - it is excessive. I've tried to find a reason for this behaviour but somehow failed to get an answer. It doesn't matter the speaker you plug into it, it doesn't matter if you use the 4 ohm or the 8 ohm outputs ...it always sound like...sleeping. Incidentally, during my search for answers, I've found the 4 ohm output to be better sounding than the 8 ohm one (regardless of the speakers' impedance). < Now, if you're thinking this may be a kind of "brand sonic signature" well think again because the single-ended model is WAY FASTER and pacey, as I'll try to explain in a while. As you can expect, considering what I've just written, the Opera 8.8R isn't a master in the dynamics department. It always reacts slowly to the inputs it receives from the source. In terms of pure sound pressure levels it gets the job done even with tough-to-drive Thiel loudspeakers (low sensitivity + low impedance). It does exatcly what a 50 watter is expected to do, nothing less and nothing more. For example, I've been able to exploit its full power output (the magic-eye power indicator dancing at full scale) even with quite efficient speakers like the Embryo by The Sound of the Valve, 93 dB/W/m full-range loudspeakers. In my opinion, there are good and bad amps. Good amps are able to create a realistic soundstage, bad amps can't (unless the designer ignores the importance of this parameter, e.g. in Flat Earth territory). Switching to the J500 Plus it is immediately evident that few things stay the same and that many others change. Before explaining these in detail let me say that the differences between these two amps are NOT subtle. Let's see: first of all the tonal balance changes dramatically, becoming much more neutral with no trace of overblown mid-bass or recessed mids (like with the 8.8 R). That charming touch is still there, as is the low distortion that makes the listening experience 100% fatigue-free. Of course, you should NEVER forget this is a 9 watts amp! Don''t ask for more or, boy, you'll be in trouble. Human voices appear to be much more natural and...ehm...human than with the push-pull amp. The heavy "interpretation" imposed by the 8.8 R has gone and voices can really "sing", each one with its own imprinting: harsh when harsh, velvety when velvety and so on. Hence, I can say that the recessed mids are gone and so the "warm" balance of the previous amp. After continuous listenings with the push-pull amp, switching to the single-ended may be a shock. Ears get used to a certain tonal balance quite easily since our brain tends to automatically "equalize". Hence, in a quick A-B comparison, the single-ended seems colder and "clinical". Not so! After few minutes you realize it is much more natural and tonally balanced. For example, guitars and strings in general appear to be much more realistic, less "reproduced", if I may. They sound harsh and metallic when strummed hard, gentle and harmonically rich when played gently. Troubles arise as soon as you have to face with the low power output and the dynamic performance. Let's put it straight once again: 9 watts (NINE), even if produced by amplifiers which are built by Celtic virgins under half-moon, are N I N E watts . It doesn't matter how much you have paid for them. They are NOT ENOUGH to produce significative sound pressure levels with mid-sensitivity (91-93 dB/w/m) loudspeakers into a decently sized listening room (30 sqm?). You need either a smaller room or far more efficient loudspeakers (95 dB, at least). No matter how carefully you play with that volume knob...you'll end up experiencing raw clipping when playing highly dynamic musical programs. Who said tube amplifiers clipping is gentle? You should listen to this poor boy screaming "Lower! Lower!" each time the going gets rough! Hey, I'm not referring to continuous clipping...this is easy to get once you run the amp at full steam. No, I'm referring to wild dynamic clipping!!! Let me elaborate this a little bit further. Imagine yourself enjoying your favourite orchestral movement, waiting for the deeply emotional crescendo and fortissimo. ...then suddenly...shreeeeeek.....and the poor 300Bs grasp for breath! Not different if you're listening to a rock song...all goes well until the...chorus! Then BAM! distortion figures go ballistic! Strange? No way!! This is OF COURSE 100% normal. The way it should be, there are laws of physics that can't be forgotten, even by vacuum tubes! This is just to warn you on what to expect. If you end up buying a few watts power amplifier because convinced by efficient marketing hype...be ready to keep that volume down if you want to avoid distortion. So, be a conscious buyer and know yourself and your needs. If your room is very small, your speakers are extremely efficient or you are used to very low listening levels then these 9 watts could be sufficient. Otherwise (big room, < 93 dB/w/m speakers, high SPL listening) forget it. The worst thing you can do to this otherwise delicious amp is pushing it over its natural limits. In order to deliver its (good) sound it requires to be put in a logical and convenient environment (room and speakers). Dynamic limitations aside, this J500 Plus beats the 8.8 R in terms of speed, pace and rythm. Within its limits, it is fast and lively, more...much more than the push-pull one. OK, the latter sounds louder...but that's all, dudes. Unfortunately I haven't been able to partner the J500 Plus with 100+ dB/w/m loudspeakers. I assume the result would have been simply amazing. From the point of view of soundstaging, this amp is on a par with the push-pull one, even slightly better: more air surrounding the instruments, more transparency and perhaps a couple of inches ;-) of extra width and depth. Chinese made HiFi gear is quickly reaching high standard of craftsmanship and finish. These two amps look nice and solid, being built with care and good quality materials. They are BIG and, even worse, TALL. This means they will force you to use the top shelf of your rack, if you don't happen to own (shame on you) an analogue record player. Heat build up is NOT negligible especially with the J500 Plus. The covering grid protects the hot 300Bs but after a few hours it becomes hot itself as well. Moreover, the grid has two lateral holes that leave enough room for an adult's hand (imagine that of a child). Not good. Even worse, the 8.8R comes without tubes protection so you have to store it far from children's and pets' reach. The remote, available only for the J500 Plus, is weird looking and not 100% intuitive. Even worse, it adjusts volume only (no input selector, no mute, no stand-by). The number of source inputs is sufficient for most uses and both amps use good quality RCAs. The binding posts for speakers are easy to use and nicely built (see pic). The power cord is of the detachable kind while the transformers are sufficiently protected. During use, the single-ended makes a slight high-frequency "buzz" , nothing that can be heard while Music is playing. The push-pull is dead quiet, instead. The owner's manual is very informative and complete as it also included some basic theory on tube circuits. The quality of the shipping boxes is of paramount importance with tube gear and these amps come with excellent "packaging". Also supplied is a pair of white cotton gloves, to be used to install or remove tubes. The two pairs I tried were too small for my hands, though (and my hands aren't big). Finally, two words on price. My comments are referred to the current "Italian" price. It is not a mystery to anyone that these amps can be bought directly from China at a fraction of the cost (more or less 800 $ each!). It takes a lot of efforts to understand how this can become almost 3000$. Anyway, there are taxes, custom fees, shipping costs, customer care, advertising costs etc etc. I don't know which is the situation outside of Italy so you may find these amps for much less then the cited price. Ask your local distributor and adjust the quality/price ratio accordingly. Of course, at 800 $, these amps are unbelievable bargains. From the point of view of pure sound quality I think I've written everything needed to understand what to expect from them. The push-pull is warm, slow and "good 'ol days" sounding. It has plenty of power but fails to get the fundamentals done right (rythm, for example). The single-ended one, on the contrary, is quicker, more transparent and overall more natural but fails to deliver sufficient power when needed (if partnered with less than 95 dB/w/m loudspeakers). I'd love to get a mix of the two amps (power, pace and balance) but, hey, this is the real world. Summarizing, and considering the J500 Plus is even slightly cheaper, I'd rate the 8.8R a bit overpriced and definitely worse than its single-ended brother. Push-pull or single-ended? With respect to the comparison test I've made I have no doubt: the single-ended is a far better amplifier. Only, it needs high sensitivity loudspeakers, small rooms or low listening level habits. On the other hand, the push-pull amp sound powerful and charming, definitely tubey. If is this what you're looking for, a listening test might be enlightening.